I have to tell you about this diabetes supply case that I'm using! This post contains Amazon affiliate links. If you choose to purchase using these links, diaVerge receives a small commission while not costing you anything extra. For MANY years, I used the tiny supply cases that were provided with my various blood sugar meters. Why? I have no idea. They were terribly designed and so small. I needed a better solution. Then about 2 years ago, I started using the Dexcom G4 CGM and I was wondering, "How on earth am I going to carry a receiver along with my diabetes supplies and pump?" I didn't want another thing attached to my waist. I couldn't ditch the receiver by using a 3rd-party app on my phone because my phone wasn't supported, and I certainly wanted to protect the receiver and keep it together with my other gear. Almost exactly two years ago, I purchased the Universal Deluxe Supply Case in the "Charm" pattern and it served me very well. I finally had a place for all of my diabetic "stuff "that I had to carry with me every day. I used that fun, brightly-colored supply case exclusively for 2 years, spot-washing occasionally, and finally, thanking it for its amazing service before throwing it away earlier this month. The old case was starting to show its age and becoming a terrible biohazard, so it was time to move on. I struggled with my choice to re-order. I loved the fun pattern of the "Charm" and was hesitant to order the "Trellis" because it's gray/black and I was afraid it looked too dull. Then I researched all the other brands that I could find and came back to the Trellis pattern from Sugar Medical. I should NOT have hesitated so long! The 'Trellis' is a beautiful pattern and with my bright pink Dexcom G5 receiver, just the right amount of fun. Expanded front "window" pouch to make your receiver /other items more accessible. A tall pocket (instead of elastic loops) for insulin pens, pre-filled syringe cases, a tube of glucose tablets, etc. I'm very impressed with this supply case and I see myself using it for a long time to come. is that they use velcro tabs to secure the meter to the case. It sounds so simple, but is very important. If you open the case, the meter will not fall out. This is NOT the standard design within the industry. A major competitor in the world of diabetes supply cases provides a small zipper pouch to hold the blood glucose meter, requiring you to pull a loose meter out of the pouch every time you need to use it, and increasing the risk of dropping the meter and subsequent breakage. Inserting a test strip is challenging enough at times! 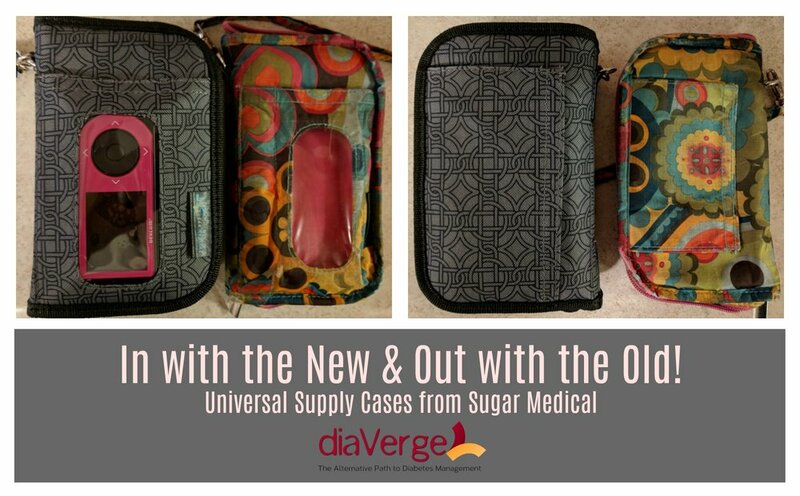 The velcro used in Sugar Medical's cases is very strong and the meter WILL NOT fall out if properly affixed to the case (watch the video below). Sugar Medical even includes a spare velcro piece that could be saved as a replacement or used for your back-up meter. If you don't use a Dexcom receiver, this Deluxe case may not be able to fit your phone in the front window pocket. My phone, the Google Pixel does not fit on the outside, but DOES fit behind the mesh "extra supplies" pouch. The front window pocket can also be used for Medical ID, instructions, a smaller phone, etc. We'd like to extend a huge thank you to Sugar Medical, as they're supplying a discount code for the diaVerge Diabetes audience. I hope you love Sugar Medical as much as much as I do! Sign up here for insider info about diaVerge's new online courses. ONLY available to the beta group!